It was a night that was short on goals and long on drama. The Seattle Sounders edged the Kansas City Wizards 6-5 on penalty kicks after a scoreless regulation and overtime period to advance to the semifinals of the United States Open Cup for the second consecutive year. Along the way there were breakaways blown, crossbars thunked, near misses, cautious play, timely saves. 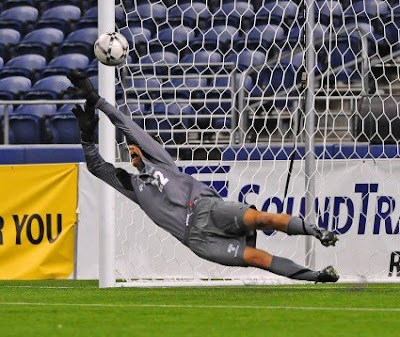 Chris Eylander saves Kansas City's 7th pk attempt. Players rush the pitch after Zach Scott's pk wins it for Seattle! It all adds up to a Sounders trip to Charleston on August 12 to face the USL Battery for a spot in the Final. The Battery beat FC Dallas 3-1 to join the Sounders in an all-USL semifinal. New England Revolution and DC United will play for the other Final spot. In penalty kicks the Sounders walked a razor edge between staying alive and being defeated. The only Seattle player to not convert his try was striker Sebastien Le Toux, who repeated his misfortune of striking the crossbar in the run of play with a try that hit the top bar in the shoot out. Le Toux's miss had followed a save by Chris Eylander on the previous KC shot from MLS veteran Jimmy Conrad. From then it was goal for goal, with tense moments when Seattle was down 4-3 and faced elimination unless Leighton O'Brien could convert. He did so with ease. In extra kicks the Sounders needed a sure foot from tiny midfielder Youssouf Kante. He came through. Then Seattle got its break when Chris Eylander saved the Wizards' 7th try from Tyson Wahl. Up stepped Zach Scott, already the 'Man of the Match' by some accounts. The longtime Sounders defender blasted the ball into the back of the net and Seattle's loud support went crazy as the boys jumped in a group huddle on the Qwest Field floor. Anyone know if we have a shot at hosting the final when we make it past Charleston? :) I think there was a bidding process up through the semis, but I can't find any information on what happens for the final. Also a bidding process. I think we have a very good shot at hosting if we make the final.